Named for the Latin word for “jewel” Gemma is a simple cardigan with lace “necklace” at the collar that is knit in one piece from the top down with a circular yoke. 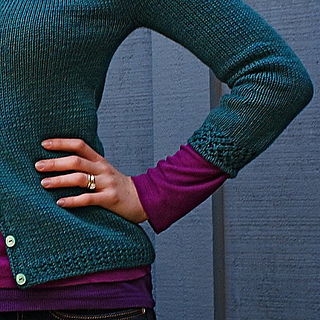 Short rows are used to raise the back collar, and sleeves are knit down from the yoke. The slightly puffed, three-quarter length sleeves have cuffs of the same lace as the collar. Gemma is a flattering cardigan that is sure to become a wardrobe staple! XS: k1, k2tog 4 times, k2tog, k1, k2tog 7 times, k1, k2tog 3 times, k1. L: k1, k2tog 24 times. This has been updated in Rev. 1 of the pattern.